English: Roundhay Garden Scene (this file is 52 frames, runs at 24.64 frames/s, and it plays in 2.11 seconds) is a 4.33 second at 12 frames per second film that was shot in October 1888 by Louis Le Prince in the suburb of Roundhay, near Leeds, Yorkshire. It is the earliest surviving motion picture. In 1930, the National Science Museum (NSM) in London produced photographic copies of surviving parts from the filmstrip. The NSM copy has 20 frames; at 12 frames/s, this produces a run time of 1.66 seconds. This sequence was recorded on an 1888 Eastman Kodak paper base w:photographic film through Louis Le Prince's single-lens combi camera-projector. Adolphe Le Prince stated that the Roundhay Garden movie was shot at 12 frames/s however, the later digital remastered version of Roundhay Garden produced by the w:National Media Museum in Bradford, which contains 52 frames, runs at 24.64 frames/s, a modern cinematographic frame rate, so it plays in only 2.11 seconds. Italiano: Roundhay Garden Scene è un filmato di due secondi girato nell'ottobre 1888 da Louis Le Prince nel sobborgo di Roundhay, vicino Leeds, nello Yorkshire. È il filmato più antico della storia. Español: Roundhay Garden Scene es una película de dos segundos de duración, rodada en octubre de 1888 por Louis Le Prince en las afueras de Roundhay, cerca de Leeds, Yorkshire. Se trata de la película más antigua que se conserva en la actualidad. 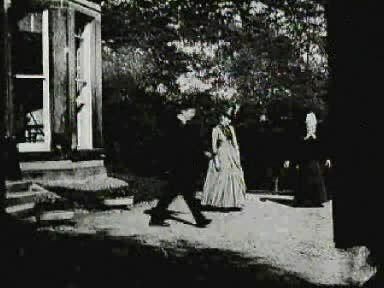 English: Roundhay Garden Scene is a two-second film that was shot in October 1888 by Louis Le Prince in the suburb of Roundhay, near Leeds, Yorkshire. It is the earliest surviving motion picture. 2006-08-19 21:49 Andrewh 384×288×0 (391606 bytes) The Roundhay Garden Scene. This 2 second film was shot in October 1888 by Louis Le Prince in the suburb of Roundhay, near Leeds, Yorkshire. The original movie file can be found at http://www.nmpft.org.uk/insight/info/roundhay.mov.